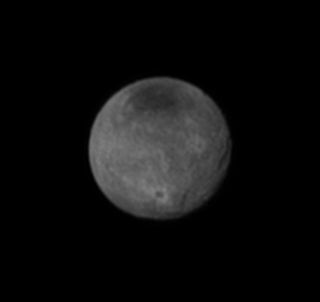 This photo of Charon, taken by NASA’s New Horizons spacecraft on July 11, 2015, highlights the big Pluto moon’s intriguing dark polar cap and shows probable craters and canyons as well. NASA's New Horizons spacecraft has spotted multiple craters and canyons on Pluto's big moon Charon, including one chasm that appears to be longer and deeper than Arizona's Grand Canyon, mission team members said. The newly resolved features are visible in an image captured by New Horizons on Saturday (July 11). The photo also provides a good look at the 200-mile-wide (320 kilometers) dark patch at Charon's north pole, whose origin and nature remain mysterious. "This is the first clear evidence of faulting and surface disruption on Charon," William McKinnon, deputy lead scientist with New Horizons' geology and geophysics investigation team, said in a statement. Annotated version of the Charon image captured by NASA’s New Horizons spacecraft on July 11, 2015. "New Horizons has transformed our view of this distant moon from a nearly featureless ball of ice to a world displaying all kinds of geologic activity," added McKinnon, who's based at Washington University in St. Louis. The most noticeable crater in the new photo, which was received at mission control today (July 12), is about 60 miles (100 km) wide and lies near Charon's south pole. The brightness of the rays emanating from the crater suggests that it formed relatively recently, researchers said. The crater's floor is significantly darker than surrounding areas, perhaps because the impact that gouged out the crater exposed different material than that found on the surface. It's also possible that material at the bottom of the crater simply has a larger grain size and therefore reflects less sunlight, mission team members said. Charon is by far the largest of Pluto's five known moons. At about 750 miles (1,200 km) in diameter, Charon is about half as wide as the dwarf planet itself. Annotated version of the Pluto photo taken by New Horizons on July 11, 2015, showing linear features that may be cliffs, as well as a large circular feature that could be an impact crater. New Horizons also captured Pluto in unprecedented detail Saturday. A photo taken that day by the spacecraft shows linear features that could be cliffs as well as a probable impact crater, mission team members said. New Horizons is speeding toward the first-ever flyby of Pluto. On Tuesday morning, the spacecraft will zoom within 7,800 miles (12,500 km) of the dwarf planet, gathering a variety of data about Pluto, Charon and the system's other four satellites with its seven science instruments. Closest approach will occur at 7:49 a.m. EDT (1149 GMT).